Have you heard enough already about global warming? It’s so ... last year’s news! Plenty of people are “doing something” about it. Becoming carbon-neutral has gone as mainstream as Girl Scout cookies; help is on the way. Can we move on, please? If the candidates’ statements—perhaps out of political necessity—are short on specifics, the reason is partly that much of the electorate still finds it hard to grasp the size and urgency of the problem. Like the naive passengers on board an ocean liner, who lean carelessly over the rail as their ship drifts into an iceberg, most of us are oblivious to the magnitude of the impending disaster. The separation closes too slowly for us to appreciate the force of the coming crunch. What is even more misleading, most climate changes so far seem gentle, even pleasant—an earlier spring, a later fall. Only occasionally does an ungentle reminder break through: this past February 160 square miles of Antarctica’s Wilkins ice shelf disintegrated. James Hansen of the NASA Goddard Institute for Space Studies and his colleagues argue in a recent paper submitted to Science that the present carbon dioxide (CO2) level in the atmosphere, 385 parts per million (ppm), has already crossed into dangerous territory. According to their study of past climatic sensitivity to changes in atmospheric CO2, there is substantial risk that within just a few centuries the earth could lose its great Antarctic and Greenland ice sheets, causing catastrophic rises in sea level, unless CO2 levels are quickly brought back to 350 ppm. All six of the scenarios considered by the Intergovernmental Panel on Climate Change (IPCC) assume that by the end of this century atmospheric greenhouse gases will reach the warming equivalent of 600 ppm of CO2 (600 ppm CO2-eq). At that level the IPCC pegs the chances at about two thirds that by 2100 the earth will have warmed between two and three degrees Celsius (between 3.6 and 5.4 degrees Fahrenheit) since preindustrial times. If concentrations rise to 1,250 ppm CO2-eq or above, as they do in two of the IPCC scenarios, the chances become about one in six that the warming will exceed five degrees C (nine degrees F). 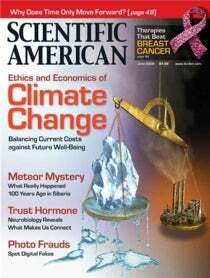 According to the Stern Review, a major report on the economics of climate change, a five-degree increase would be “far outside the experience of human civilisation.” It would also risk “irreversible ... physical changes, such as the collapse of ocean currents,” as well as “mass migrations and social instability.” It gets worse. The IPCC puts the chances at 5 percent that even if CO2-eq levels stabilize at 550 ppm, global temperatures will eventually rise by eight degrees C (14.4 degrees F). Both the Stern Review and John Broome, in his article “The Ethics of Climate Change,” are explicit about the ethical dimensions of society’s response to global warming. At bottom, the issue is much like the one older voters must face when their local government proposes a hike in school taxes. How much do we really care about the well-being of future generations? How much of the good life in the present are we willing to forgo to provide for our children and grandchildren? Or think about it this way. Imagine you are living in the year 2108, and you are keenly aware that the political dislocations all around you were preventable catastrophes. Decades of turmoil caused by vast migrations of people who could not find enough food or clean drinking water; the crop-destroying volatility in the weather; the drying up of capital as investors withdraw whatever they can from unruly markets; the scourges of insects and disease set loose by the poleward advancement of the tropics—all of these are the legacy of your forebears who should have known better. Wouldn’t you look back and shake your head at the feeble attempts at mitigation by the present age, the endless dithering over the reality of climate change, the head-in-the-sand policies that assumed addressing the problem could be put off for another day and that the future would be clever enough and rich enough to take care of itself? This story was originally printed with the title, "Climate Fatigue".